I’ve been a bit lazy this week, so I’m only going to do quickies in terms of reviews of stuff I’ve watched over the last week or so. Kimihiro Watanuki is a high school student constantly plagued by spirits who seem to be attracted to him, which of course no one but him can see. One afternoon has him being chased by a bunch of spirits when he suddenly stumbles upon a shop run by a mysterious woman named Yuko Ichihara. She claims that she can rid him of the spirits that follow him. However there’s a catch; like all wishes she grants, the payment for them must be of equal value, so Watanuki must become Yuko's part-time employee until he has racked up enough time so she can perform the wish. Yuko puts him to work mainly on household chores and errands, but mostly having him cook meals for her, and her companions, two strange young girls called Moro and Maru, and a small black talking creature called Mokona. During the period where Watanuki isn’t being hassled by Yuko and her companions for food and sake, he is also helping out and poking his none into requests from clients. He soon realises that Yuko can command supernatural forces and often finds himself in thr thick of the supernatural world. Occasionally his school friends, Himawari Kunogi (a girl who he seriously has a crush on) and Shizuka Doumeki (a gruff boy who he suspects is a rival for Himawari’s affections), get caught up in Yuko’s world as well. Supposedly this series can be watched in conjunction with “Tsubasa Reservoir Chronicle”, but really I couldn’t be arsed. 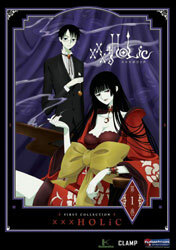 While characters from “xxxHolic” appear in that show, you could easily watch this show without every watching “Tsubasa”. There’s not one reference made to any of the characters or any of the situations in that show. I stupidly bought this series because it was rather cheap. I later regretted at as I expected the show to be full of stories where someone wants a wish and has to pay ironically and painfully for that wish. There is some of that in the show, but it’s thankfully quite subtitle. And most of the time “bad things” don’t actually happen to Yuko’s clients. In fact it seems most are reasonably happy (or at least satisfied). There’s also more of reliance of basing stories around the regular cast (or returning characters) rather than one off characters. The main problem with the show (and everyone seems to point this out) is the animation. This is really disappointing seeing as it’s a Production I.G show. About mid-way through the series, characters go off model something dreadful. Their arms become way too long; their necks are insanely long and at one point Yuko just looks like a mess with her breasts in an odd position. The characters do go on model again, but it’s just very, very sloppy work in my opinion. While the stories are pretty good (most episodes are self-contained) I though the series went off track just before the end. There’s also no real end to the show. The character just keep having adventures randomly, though there is a two parter at the end which has Watanuki on the verge of death, but it wasn’t exactly much of a climax. In the end, it’s a bit of strange show with some rather mediocre animation in the middle. I did enjoy a fair amount of it though. I really find I haven’t enjoyed much of Clamp’s material since about 2001 or so. 6.5 out of 10. It had been exactly 15 years since the last Japanese Ultraman series, “Ultraman 80”, which finished in 1981. However in the intervening years there were several other Ultraman series; a co-production with the South Australian Film Commission called “Ultraman: Towards the Future” was made in 1990. A US co-production called “Ultraman Powered” was made 1993 and an “Ultraman vs. Kamen Rider” TV special with Toei the same year. There were also a couple of animated and unofficial productions as well in the 15 year gap. March 1996 brought Japan a new Ultraman in time for the franchise’s 30th anniversary. A movie omnibus called “Ultraman Wonderful World” which featured the shorts “Revive! 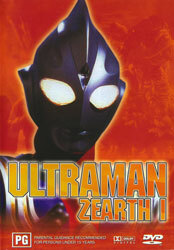 Ultraman” and “Ultraman Company” as well as a 50 minute movie called “Ultraman Zearth”. In this film, gold is being sucked up by a mysterious force. It’s up to MYDO (Mysterious Yonder Defence Organization), an anti-alien invasion force organisation disguised as attendants in working petrol station which doubles as their secret base. Katsuto Asahi (Masaharu Sekiguchi) is a lowly, practically spineless trainee in MYDO, and can’t even go out on missions, and is also made fun of by his colleagues because of his obsessive compulsive issues with dirt. Of course the only one who doesn’t make fun of him is Tohru Hoshimi (Yuka Takaoka), naturally the two of them begin developing romantic feelings for each other. Unbeknownst to everyone is the fact Katsuto is Ultraman Zearth. Unfortunately he’s not very good at his job and has trouble fighting. Making matters worse is the alien Benzen Seijin (Takeshi Kaga, that’s right, Chairman Kaga from “Iron Chef”) in his human form taunts Katsuto at every opportunity at the petrol station by wiping dirt and oil on him. It is finally revealed a monster called Kottenpoppe is staling gold to convert to energy for Benzen Seijin. Naturally MYDO fail in stopping the alien’s plot and Tohru and several children are kidnapped by Benzen Seijin to draw out Zearth. The second film was released the next year and was paired with the anime short “Ultra Nyan” which is about an Ultraman cat. In the second film, Zearth comes face to face with Ultraman Shadow, who sent there by Benzen Seijin’s sister, Lady Benzen (in human form played by the lovely Misato Suzuki). Having been defeated, Katsuto has a crisis of confidence and believes he can no longer defend the Earth as Zearth. First I think I should talk about the major problems with these discs. First, they’re dub only (an obscure dub by the Ocean Group in Canada. It seems the dub has only been released in Australia) and second it’s 4:3 letterboxed. The dubbing is overplayed and is just tolerable in places. There’s also a theme of taking the piss out of the films, and even though they are parodies of Ultraman, I still think it’s disrespectful to the original material. Third the cover pictures for both discs are not an image of Ultraman Zearth, but Ultraman Tiga (the same images with different colourer backgrounds). One can only wonder why Force decided to release this show in Australia. Besides a very late night airing of “Ultraman: Towards the Future” by the Nine Network in the non-ratings period in late 1991, no other Ultraman show has screened or been released on video here. There really is no introduction to the situations or explanations for monsters or in the show. It requires some knowledge of the Ultraman franchise. There’s also a number of cameos in the film by all of the original Science Patrol from the original 1966 Ultraman and a couple of the cast from Ultraseven and Ultraman Jack. As you can imagine, the dub writers gloss over all of this and any subtle references to other Ultraman series in the films. The first film is pretty mediocre and very, very silly. I found it annoying that Katsuto is treated like crap by his teammates. The second film is far better in plot and special effects. Takeshi Kaga does a fantasic job as the evil Benzen Seijin. It’s a shame that you can’t hear his original voice on the disc. It’s a far better performance than what the dub actor gives. I’m realy not too sure why these dubs were created to be honest. They certainly don’t help the films at all. I can only give a combined score of 5.5 out of 10 for these discs. At the end of WWII, the United States of America and Japan develop secret super submarines built from technology from the subterranean civilisation called Mu. However both submarines go into battle in final moments of the war and sink each other, leaving no trace of their existence. Some 50 years later, strange occurrences begin to happen in the Antarctic, with large amounts of microwaves being detected and huge sheets of ice breaking up and drifting north. A task force from the UN is set out to investigate and they discover an enormous black cylinder is the cause of it. After getting too close, the cylinder shoots laser beams towards the task force, killing the leader. UN forces are suspiciously close behind and begin their attack. However large red rings defeat them before they have any real chance. Go Arisaka, one of the young members of the task force awakens from the disastrous battle and finds himself inside the medical bay of a large gutted ship. He is more surprised to find he is inside some sort of huge dry dock where a super submarine, the Ra, is being rebuilt. ON board he discovers a man who looks like his long lost father, presumed lost at sea, though the man denies it and claims his father is dead. Go also discovers fellow task force member and girlfriend Annette has survived. She isn’t exactly what she seems. The crew of the Ra have rebuilt the Ra, from the plans of the original WWII sub, and plan to fight the Mu civilisation, which sent out the cylinder and rings to defeat the UN, from taking over the world. I haven’t seen this OVA series for almost 15 years. This OVA is based on the same novel that the original 1963 live action Toho film “Atrigon (Kaitei Gunkan)” was based on, but there the similarities to the two versions end. One can only wonder why ADV decided to market this tape under the Atrigon name. In the late 1990’s only dedicated tokusatsu fans would have recalled the original film. Like a number of OVA series of time, there’s a fair wack of money ploughed into this film. It looks pretty good, though the cel animation doesn’t quite stand up to today’s computer coloured stuff, and the Warsaw philharmonic provide the score. Yoshikazu Yasuhiko provides character designs and there’s a couple of voice actress such as Junko Iwao and Kikuko Inoue in the cast. It’s a pretty good sci-fi fantasy with plenty of action. 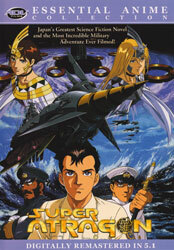 The production does reuse a number of animation sequences, especially in terms of the fighter jet battles. The ending was also really left open. But of course there’s never been any follow up OVA series to the show. Overall I think it’s a solid, really fun show. 7.5 out of 10.